Relocating for work, or moving for an extended stay? Maybe you just want more info on the destination of your next corporate stay? Either way, our eBooks and relocations guides are crammed with all the necessary info you need to have a successful business or leisure trip. Some of the biggest economic hubs in the world are covered. So whether you’re relocating or moving to London, Paris, New York, Tokyo, Hong Kong, or any other financial and cultural centre, you’ll have everything you need. From the costs of living in London, to healthcare in Tokyo, schools in San Francisco, transport in Amsterdam and tourist attractions in Paris, each chapter in every eBook covers the essentials to short and long term stays and relevant information that even a weekend visitor to the cities will find helpful. These relocation guides come in an easy-to-download pdf format, are completely free and a are a must-have. Make your trip or relocation to Tokyo hassle free thanks to our 2019 Tokyo relocations guide. Get all the lowdown on costs of living in Tokyo, healthcare, attractions and more with the click of a button. Understanding and navigating the exotic city has never been easier. Relocating to The City by the Bay is made simple with a simple tap on the icon. From the costs of living in San Francisco to other important aspects like healthcare, educations transport, accommodation and more, everything's here for your convenience. Once the hub of the Golden Age, Amsterdam is fast becoming the go-to city for relocation. To make your short or extended stay in Amsterdam a walk in the park, download our guide and get all the info on the cost of living in Amsterdam and so much more. A hassle free relocation to Sydney is right around the corner when you download our 2019 Sydney relocation guide. Discover the costs of living in Sydney, the healthcare system, best schools for children, attractions and much more. All yours with the click of a button. Moving to Hong Kong? Our 2019 Hong Kong relocation guide is an in-depth study of everything you need to know before moving to the city. Find tips for finding your ideal accommodation, cost of living, the healthcare system and more. Make your move to Singapore all the more easier by downloading our 2019 Singapore relocation guide. Over the course of 6 thoroughly-researched chapters, learn how to live in Singapore, how to get healthcare, how to pay your everyday bills and much more. Our 2019 New York relocation guide brings you our tips for finding your ideal accommodation, managing your cost of living, understanding the city’s public transport system, finding appropriate schools (or childcare) for your children and more. Moving to Paris? Read through our tips for finding your ideal accommodation, managing your cost of living, understanding the French travel system, choosing healthcare for your entire family and more when you download our 2019 Paris relocation guide. Relocating to a new city can be a daunting prospect for anyone. Our London relocation guide has been updated for 2019 with all the relevant informant a new Londoner might need. From accommodation to travel to healthcare and tourist attractions, this eBook covers it all. 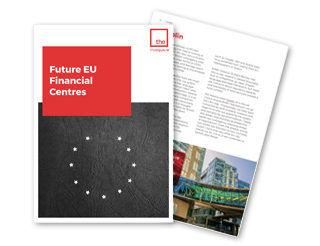 With the UK leaving the European Union, here at thesqua.re we've been busy investigating where the future financial hubs of the EU could be. The study includes views from a number of industry experts, as well as newly released Livability scores from the Economist Intelligence Unit.